Bundled pricing available for this course plus my other pre-recorded trainings. Click here for more information. Often these traumas didn't happen to you. Instead they affected ancestors who never cleared them. Whether you're a healer, a sufferer, or a caregiver--this course improves how you see and live your life. 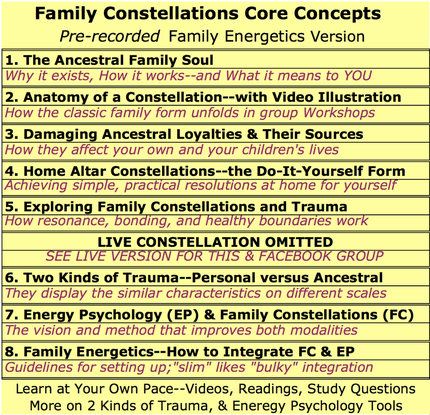 I'm passionate about Constellation Work, Energy Psychology, and the new, neurologically based understandings of trauma. They've saved and changed my life. This is super practical partly DIY stuff. And I'm a creative integrator. I present internationally at constellation and energy psychology conferences, have re framed and expanded Bert Hellinger's ideas, and written 2 books about this. "Wanted to compliment you on the fantastic job you did presenting complex material in such a concise and lucid manner." lead to repeated physical illness, or chronic conditions that won't heal? create ongoing depression, anxiety, addictions, or compulsions? keep family members out-of-synch or even hostile to one another? stand in the way of fulfilling work activities and the abundance that comes with them? keep creating similar or repeated relationship failures? don't respond to remedies pointed only at symptoms or you as an individual? sow doubts around supportive spiritual connections? The CORE CONCEPTS webinars will open your eyes. All of these are highly treatable with Family Energetics methods you can understand easily. Start applying them yourself, or know how to find the right professionals. 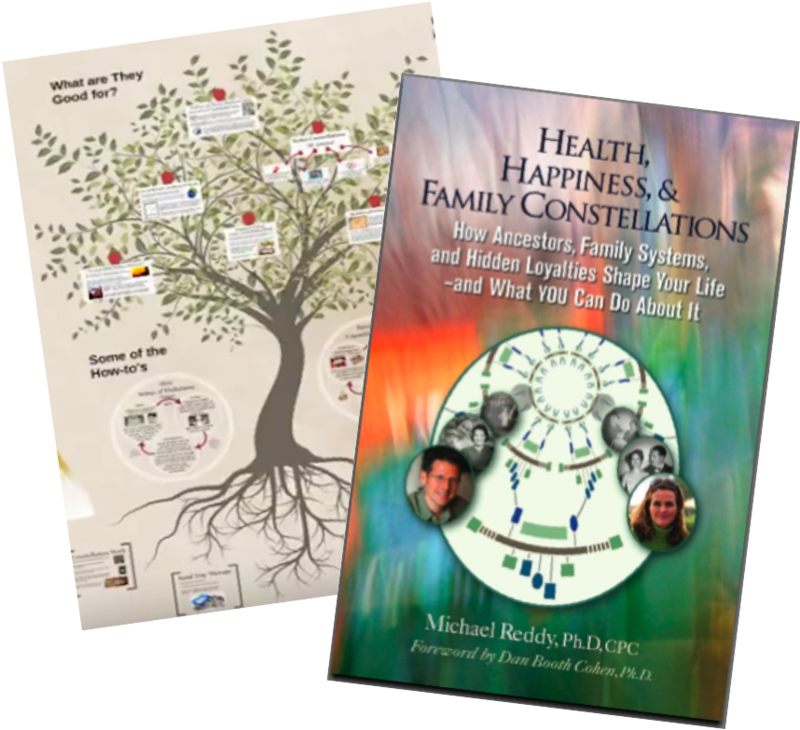 Game-changing discoveries in social neurobiology have made it clear that our nervous systems are designed to belong to and share the burdens of our ancestral families. Unresolved traumas (either events or ongoing patterns) leave parts of your inner and outer families disconnected. Be free of the misconception that all wounds you carry belong purely to you, and apply the same wider perspective to family and friends. Have a crucial, big-picture view of the damage trauma does as it "scales" from organizations to families to children, and "cascades" down through generations. Left-over loyalties to unresolved overwhelms in your birth family's past shape your life--too often for the worse. And they will do the same with your children.